Just like every other weekend at Friendship Park, dozens of people have come to meet and greet one another on both sides of the US-Mexico border fence, an experience that many describe as being “bittersweet”. Access to physically touch the wall on the US side is limited to a small area and families lean against the fence trying to catch a glimpse of their loved ones through the steel mesh which is so tightly woven they can barely touch fingertips. Couples quietly whisper in each other’s ears while Border Patrol agents walk back and forth in what can be compared to a prison yard on visiting day. On the Mexican side of the wall, the atmosphere is more relaxed. Among those present is Jose Marquez, a 67-year-old Mariachi singer, who has come to see his daughter Susanna. Although they live just a few miles apart, they have been separated by the US-Mexico border for almost fifteen years. Griselda San Martin is a Spanish documentary photographer and visual journalist based in New York City and Tijuana, Mexico. She graduated from the the documentary photography program at the ICP in New York and also holds an MA in journalism from the University of Colorado. 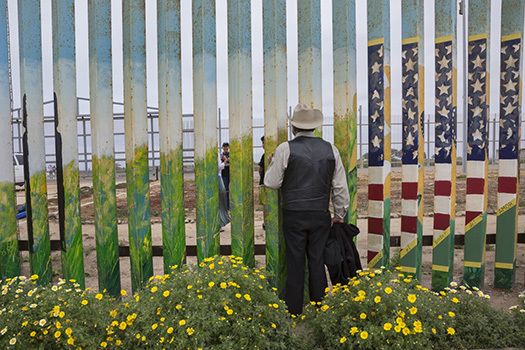 For the past five years she has been documenting the US-Mexico border, staying most of the time in Tijuana, a community that has been a victim of Mexico's drug war and has been plagued by poverty, crime and violence. Her long term projects delve into issues of immigration, deportation, inequality and human rights violations. She is currently focusing on the Hispanic community in the US, exploring the effects of the rising xenophobic political and social climate in vulnerable minorities such as the undocumented immigrants. Her work explores transnational issues and focuses on concepts of identity and belonging. She is interested in in-depth stories that transcend borders and cultures and challenge popular assumptions and dominant media discourses. Her work has appeared in publications such as The Washington Post, The New York Times Lens Blog, The Huffington Post and FotoEvidence in the United States, Capture Magazine in Australia, El País and Revista 5W in Spain and Animal Político in Mexico, among others.